It has been an exciting year for Mags Walker and Toolally, the Yorkshire jewellery brand breaking onto the scene with a feature in the August issue of Vogue, their earrings modelled by Lara Stone. 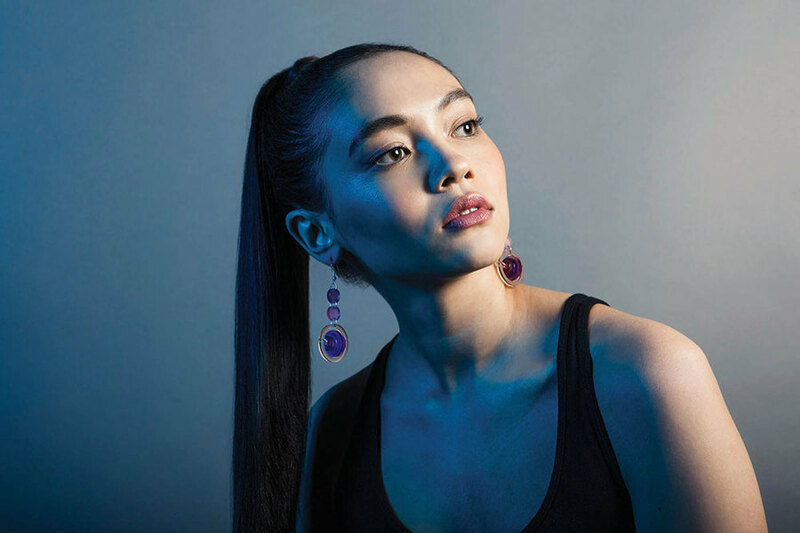 Toolally have reimagined the aesthetic of jewellery by combining unconventional materials such as Perspex, stainless steel and solid brass to produce collections bursting with unique shapes and bright colours. Describing their work as ‘jewellery sculpture,’ Toolally aim to combine art and fashion to create bold yet wearable pieces. According to creative director Mags Walker, the Toolally style is a fusion of her obsession with fashion and head-of-studio Kelly’s passion for art. Despite qualifying as an accountant – "My dad wouldn’t let me do art!" she exclaims – Walker began working with fashion brands such as Topshop in a role at an advertising agency. This fuelled her passion for design, and she went on to work in the creative industry as a creative director for more than a decade. Based in Yorkshire, with the studio located on a country estate and their shop in Barnoldswick, the Toolally brand is influenced by its location in the North. According to Walker, the influence of studying and working in the North is evident "in the sense that we don’t take ourselves too seriously." This injection of fun and playfulness runs throughout all of the collections. How did Toolally come about, then? It seems that Walker’s ears needed a break from the old-school earrings (think Pat Butcher) that she loved, but that "hurt like hell." Forget the old saying "pain is beauty" – Walker and her team work by the mantra that "beauty should categorically not be painful." This explains their use of lightweight materials such as Perspex and recycled acrylics. Toolally use laser and hand tools in a variety of frosts and mattes to create a number of interlocking pieces. It’s a fairly technical process, as Walker explains: "We sketch an idea, convert it online to a DXF ﬁle and cut or mark using our laser-cutting machine. Then, dependent on materials, we laser- or hand-cut the shapes." Seeking a move away from the cheap metals that had dominated with the normcore and grunge trends, and the standard styles of costume jewellery, Walker "felt it was time to get back to a bit more glam." It was an appropriate time to bring bling back, coinciding with the likes of Prada and Marni. Walker loves dressing up and "creating looks from different eras." She sees jewellery as the ultimate accessory for doing this, and much of the inspiration for Toolally’s collections comes from re-interpreting and re-inventing iconic shapes as well as developing futuristic ideas. Colour also plays an important role, and the pieces certainly do not shy away from it. The team create unique colour combinations with the Perspex so that no two are the same. Toolally jewellery is designed to make a bold statement yet still be wearable – allowing the wearer to feel confident and glamorous. Only two months after launching, Toolally lived the dream and were featured in Vogue, with their creations appearing in an editorial spread shot by Mario Testino. Walker remembers thinking she had "died and gone to heaven" when she saw the photographer’s credit. The support from Vogue clearly came as a sort of affirmation – "Vogue’s support gave us the confidence to believe in what we were doing. I wanted to make jewellery but didn’t want to be the same as anyone else," Walker says. She is keen to pass this boost of support on to customers – "I wanted to create a collection that screamed confidence… [that screamed] I love this colour, I love this style and I’m not afraid to say so." Clearly the uniqueness of Toolally’s design aesthetic has made the brand stand out, with stockists now signed up in Scotland, Japan, Spain, Italy and South Africa. This comes on top of selling a pair of earrings every three minutes for three days in a row at the recent Stylist live event in London. It’s clearly been a surreal six months for the brand. Dreams already seem to be becoming reality, and Walker hopes things stay that way. So, after all this success, what’s next for Mags Walker and Toolally? Onwards and upwards it seems, with plans to produce a full professional look-book, to expand with new stockists – Walker dreams of Selfridges – and to continue on their mission to make beauty that bit less painful. If 2015 is anything to go by it seems that next year will be even more bright and beautiful for Toolally. You can check out Toolally’s beautiful designs at shows in the New Year including Top Drawer (17-19 Jan) and Pure London (14-16 Feb), both at Olympia, London. In the meantime, find them at toolally.com or their store in Barnoldswick, Lancashire or in the gift shop at Gallery of Modern Art, Glasgow.